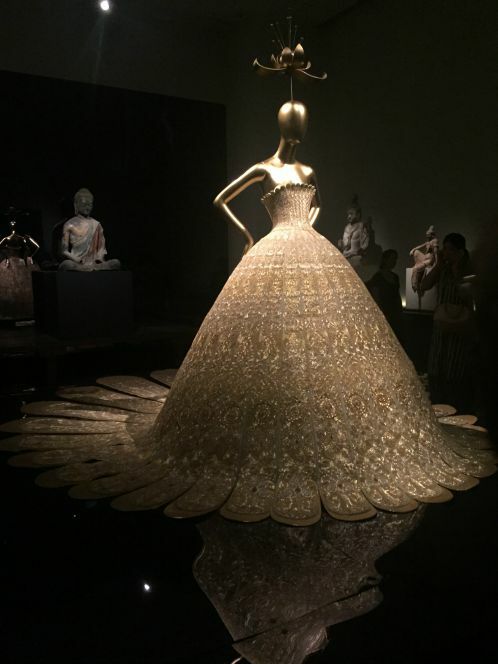 Earlier this month, I squeezed in a visit to the record-setting “China: Through the Looking Glass” exhibit just before the end of its run at the Metropolitan Museum of Art’s Costume Institute. 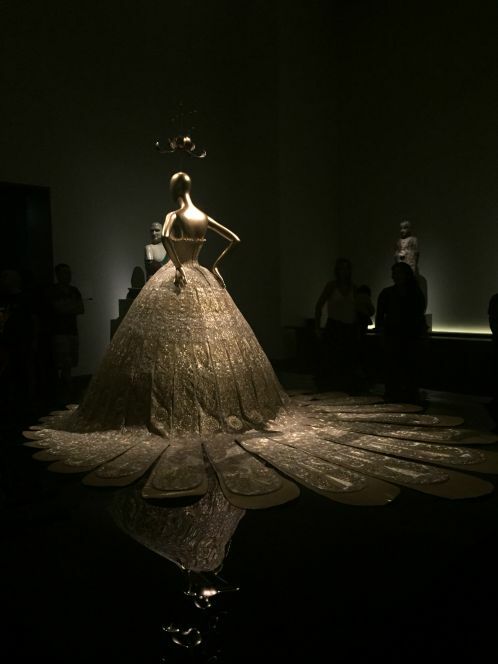 The show would have been worth it for this gold Guo Pei dress alone. Rihanna wore a fur-trimmed yellow cape by Guo Pei when she attended the opening gala for the exhibit in May. She’d look amazing in this dress too. That girl can handle a lot of fabric. In between the many extravagant ballgowns, I was pleased to discover this lower-key Yves Saint Laurent look by Tom Ford. The ensemble was from the Autumn/Winter 2004/2005 collection, and I’m now positive my own chartreuse YSL skirt is from the same collection. 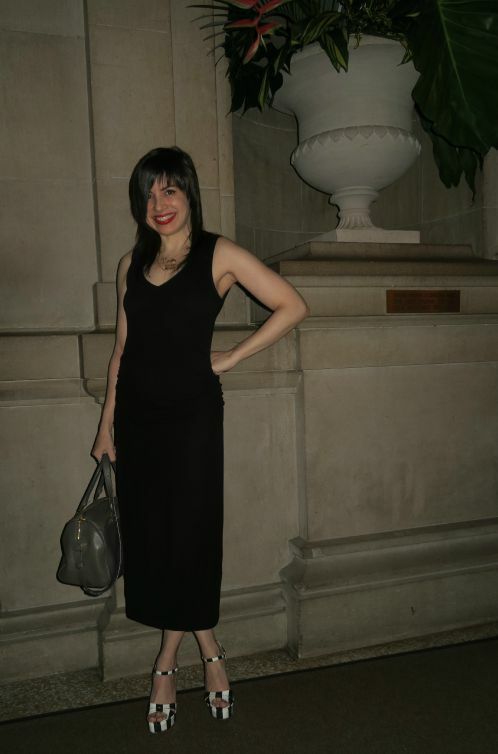 When I posted the skirt in 2011, I guessed that I had purchased it between 2002 and 2005. Now I can narrow that down to 2004-2005. I am pining for the blue jacket to wear with my skirt. I was not-so-pleased to see examples from Vivienne Tam’s provocative 1995 Mao-printed collection, just because they reminded me that I foolishly gave away one of her sequined Mao t-shirts before I realized that closet purges are not all they’re cracked up to be. That t-shirt — which showed Mao with a bee on his nose — is one of my major purging mistakes, along with a silver Todd Oldham top that I am still hoping to replace via eBay or Etsy. 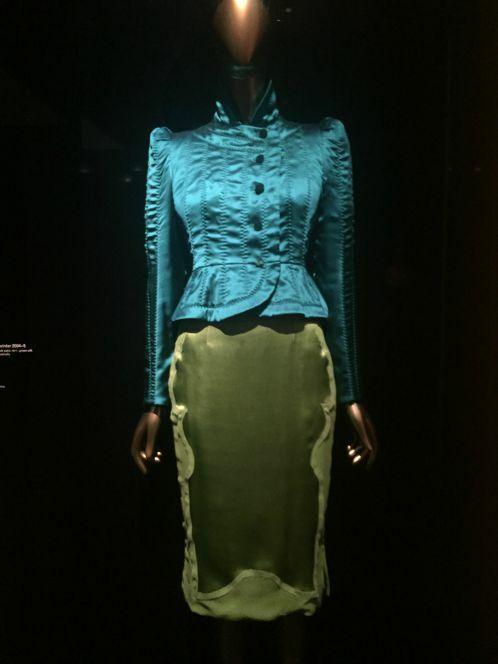 I also thought it was a shame that the exhibit didn’t include anything by my designing friend Zang Toi, who was born in Malaysia to a family of Chinese descent and whose Fall 2014 collection was inspired by 1930s Shanghai. The Met could have shown one less John Galliano-designed chinoiserie fantasy for Dior in order to include a piece by a New York-based designer who actually represents his Chinese heritage in his designs, don’t you think? 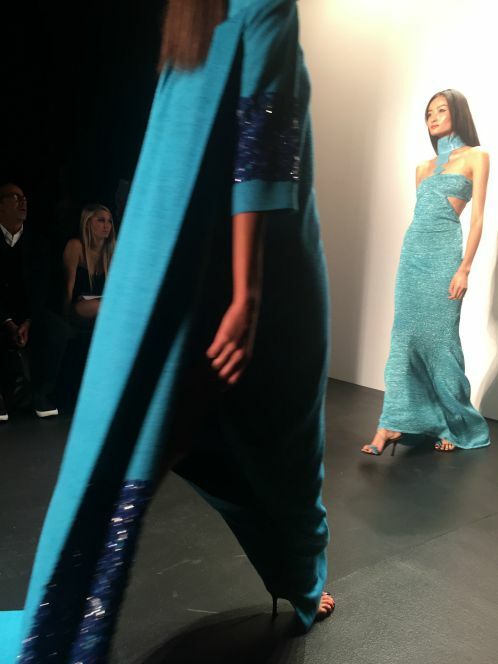 I wore one of Zang’s Shanghai-inspired qipao dresses to his Spring 2016 runway show for New York Fashion Week last Friday. Strange background: I worked in this building when I was at CNN from 1995 to 1999. 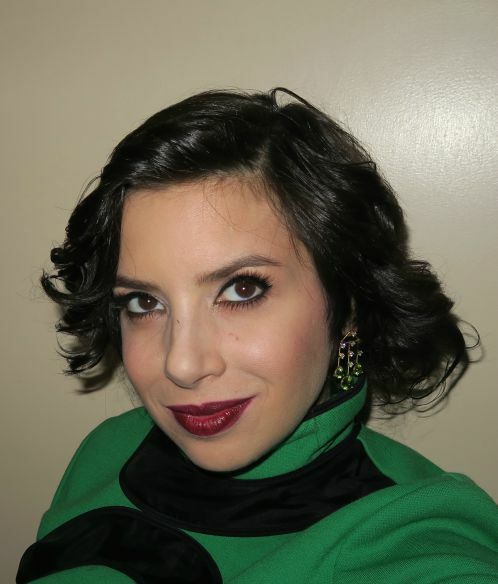 Here’s a close-up of my hair and makeup. Julie Matos of Warren-Tricomi did my hair as usual, but my friend Josie Torres wasn’t available to do my makeup. I really love what pinch-hitter makeup artist Hailey (Hayley? Hailie? Why are there so many spellings of this name?) of Kimara Ahnert did with my eyes. I’m wearing my own peridot and diamond chandelier earring design. When I walked into the venue, one of the first people I saw was Zang’s friend, model Deborah Fenker, who got a laugh out of my outfit: When we posed together after Zang’s show last September, she was wearing this very dress. Deborah wearing the dress last year. Click for original post. Zang’s collections are often inspired by his travels, and this show was all about the whites and blues of the Greek island of Santorini. Zang is sticking to his tradition of including a bare-chested male model on his runway. Why not? The dudes always get an enthusiastic round of applause. I was more fixated on a surprising pop of green amid the blues and whites. Zang’s greens are always beautiful, and this diaphanous gown on model Georgie Badiel was my favorite look. Georgie knows how to work a dress like no other. Check out this photo of her in 2013. Now that I think of it, I most often want the dresses that Georgie wears! Zang needs to clone this woman and have a whole show modeled by an army of Georgies. I’d have to buy every single look. 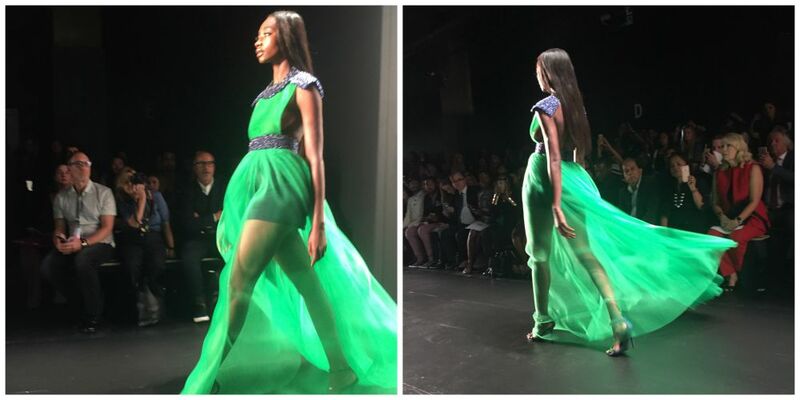 UPDATED SEPT. 22, 2015, TO ADD: I added a link to my green Zang Toi dress to Not Dead Yet Style’s latest Visible Monday post. Click here to check out the other visible ladies. That was a GREAT exhibit! Zang’s show looks fabulous, as do you! Wow, I love that green Zang dress on you, Wendy! Stunning! Fab hair/makeup as well – I do love that you go all out for these events. Hear, hear, where is the love for local designer Zang? That’s outrageous. You need to write a letter! Lovely you in all shots of your outfits. You sure can handle a closeup, young lady! Brilliant dresses … and thank you so much for sharing a bit of the show.